The Sports Performance Institute is The MAC’s in-house strength and conditioning and sports performance department. We focus our programming to three main goals: 1. Build overall athleticism, 2. Reduce risk of injury and 3. Increase athlete durability. Every class includes a dynamic warm-up, resistance training using an individualized card, and some level of conditioning. Our coaches are certified fitness professionals, have a background in competitive athletics and are trained to inspire, educate and effectively get results. We know what it takes to reach the next level of performance and what it takes to keep an athlete on the field, injury free. First class free for new athletes. Our Athletic Performance Training program runs from Fall through Spring and is held primarily indoors. 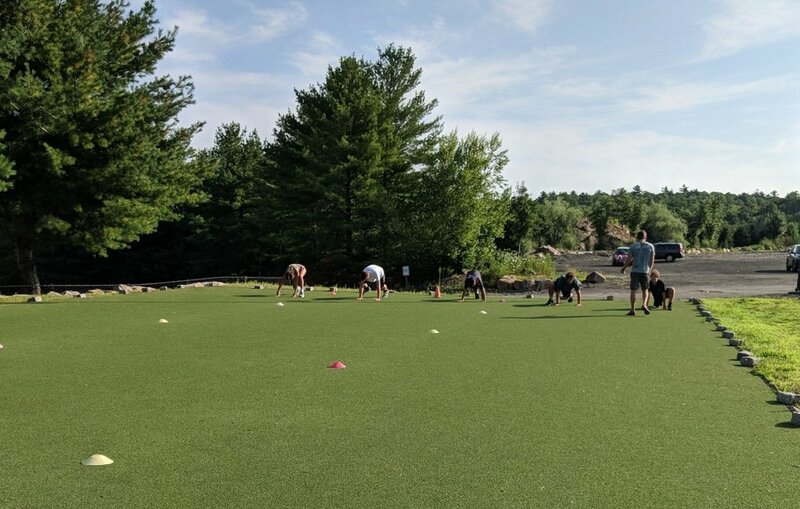 With this hour long class the athlete will be taken through a dynamic warmup, speed and agility drills, resistance training, and conditioning. The class is a small group format capped at 8 (middle school) or 10 (high school) athletes per session. Athlete's enroll for each class through our MAC Fitness App, and can begin at any point during the session. This allows for maximum flexibility. Our PLUS Program runs during the summer months and is broken up into (2) four-week sessions, with an additional/optional two-week session. The class is 30 minutes longer than the Fall-Spring program and is held in an outdoor weight-training facility. The extra time allows for a more comprehensive program that includes performance assessments, speed and agility drills, resistance training, and conditioning. For teams or groups (5-8 athletes) interested in training we offer hour long private training blocks with custom programming along with performance testing to meet your team or group’s needs. Contact mpudvah@macathletics.com if you are interested in setting up team / group training. Matt is a graduate of Springfield College with a Bachelor of Science in Applied Exercise Science. Matt holds several certifications including NSCA's Certified Strength and Conditioning Specialist, Reflexive Performance Reset Level 2, Functional Movement Systems Certified, and IYCA's High School Strength and Conditioning Specialist. Matt has experience working with diverse populations including elite collegiate athletes while at Quinnipiac University. He also specialized in post-rehab, post-injury, and injury prevention strength and conditioning. Matt enjoys helping his clients boost their confidence, well-being, and physical performance. NSCA-CSCS, RPR-2, FMSC, HSSCS.